Olympic National Park in Washington state is a large and beautiful national park. 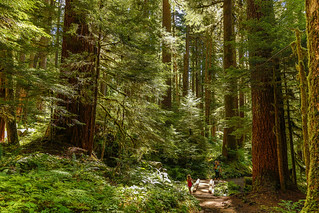 My family went on a hike to see the waterfalls near the Sol Duc Hot springs and were in awe of the redwood trees. I snapped this pic to capture the sense of scale. Love how it turned out.